Students toss “snowballs” — crumpled wads of paper containing summaries of Gary Green’s primary lecture points — in his forestry and natural-resources class at the U. of Georgia. When wadded up papers start flying across the University of Georgia lecture hall where Gary T. Green is teaching, it may look as if he’s lost control of the class. But these are the times, he says, when his students are most engaged. Each time a “snowball” lands on a desk and a student unfolds it, the recipient writes down three points that he took away from a potentially confusing part of the lecture. He in turn balls up the paper and throws it to a classmate, who smoothes it out and adds three more points. 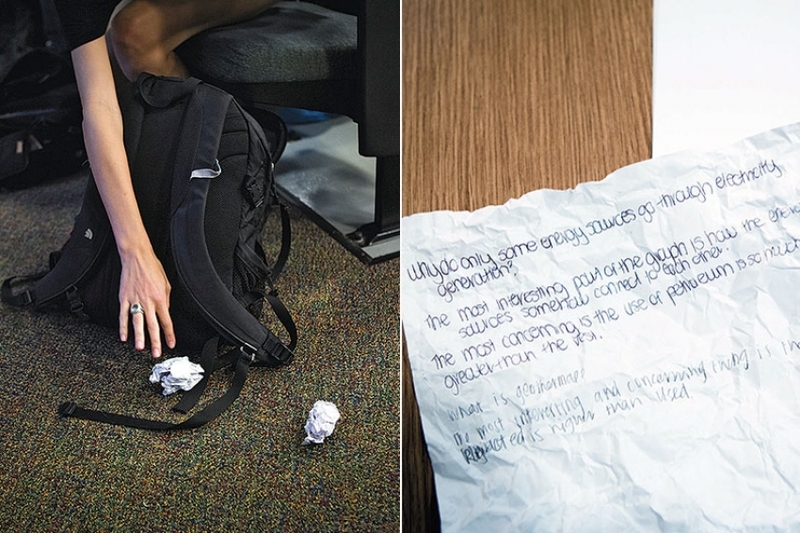 By the time the snowballs have been crumpled and uncrumpled twice, each one lists nine bullets to help students summarize the main ideas of the lecture. Mr. Green, a professor of natural resources, recreation, and tourism, is always on the lookout for ways to energize his students and encourage the shy ones to speak up. Mr. Green shares his ideas about teaching a large class, and borrows others, in faculty learning communities organized by the university’s Center for Teaching & Learning. These committees, made up of five to 15 participants, meet about once every three weeks throughout the year. Members are encouraged to share their strategies with the broader faculty through workshops, short summaries, or journal articles. At a time when budget cuts are causing student-to-faculty ratios to climb on many campuses, the pressure to make students feel like more than a roster number has intensified. A national study published in 2014 found that grades improved and failure rates decreased when active learning was incorporated into large science, technology, engineering, or math classes. That’s not always easy to do in classes with hundreds of students. But active learning takes place in many forms, as Georgia’s efforts illustrate. Faculty members who have been teaching the same way for decades are more likely to buy in to new ways of teaching if the ideas are coming from their peers, and not from administrators. “One-off workshops don’t necessarily bring about the significant changes in faculty practice we’re looking for,” says the director of the Georgia center, C. Edward Watson. Because the faculty learning communities meet every three weeks, participants are more likely to try out and report back on the strategies, he says. When it comes to generating ideas, Mr. Green is never at a loss. Once he plunked his brown-bag lunch on the lectern and a student asked what it contained. The professor grabbed a marker, scrawled a question mark on the bag, and told the class that the first person to ask a particularly insightful question could reach into the bag and help herself. The tuna sandwich he had intended to eat for lunch was a hit, as were the packs of gum in later classes and the Spider-Man toy his son had tired of. During such times, “the energy in the room goes way up,” Mr. Green says. Translating one professor’s brainstorm into a strategy that others can use is one of the goals of teaching and learning centers like the one at the University of Georgia. To encourage more faculty members to jazz up their large classes, Georgia selected 25 of them to be part of a new fellowship for innovative teaching. All but two had classes of 100 or more students, some teaching as many as 900 students per semester. Their focus last year was on flipping the classroom, a technique that involves having students read lessons and watch videos beforehand so that the class can focus on exercises, projects, and discussions. This year’s cohort is focused on a technique called Scale-Up, Student-Centered Active Learning Environment with Upside-down Pedagogies. 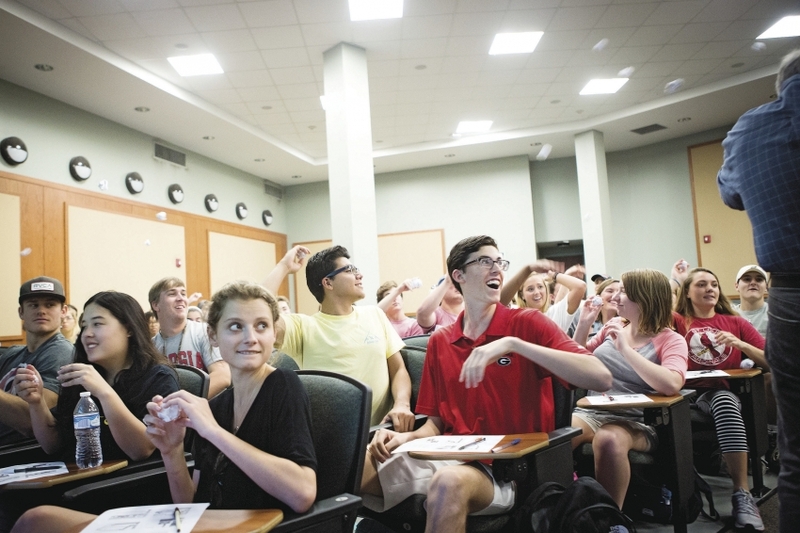 The strategy, which was championed by a North Carolina State University physics professor and since adopted by more than 200 colleges, involves breaking large classes into small teams. Students sit in three groups of three at round tables where they share computers and work on exercises while instructors circulate. Each time a “snowball” lands, the recipient unfolds it, writes down three points from Mr. Green’s lecture, then balls up the paper and throws it to a classmate, who adds three more points. By the time the snowballs have been crumpled and uncrumpled twice, each paper lists nine of the main ideas from the lecture. The technique has been credited with improving pass rates among students who typically struggle in large introductory classes. At Georgia, faculty members looking for ways to improve their teaching can also sign up for midsemester evaluations by a team from the teaching center. The evaluators excuse the professor and ask the students three questions: What aspects of the class are going well, which need improvement, and what changes in the course would help them learn? After a discussion, the suggestions are written on the board and students vote for their top two. Within a week, an evaluator meets with the professor to discuss the weighted results and consider strategies for improvement. Peggy Brickman, a professor of plant biology at Georgia, says she started offering more-frequent practice questions after students said they were getting “blown away” by her exams. In a survey that Ms. Brickman helped administer to about 450 science-faculty members nationwide, most said they were dissatisfied with the feedback they were getting about their teaching. The input they wanted most, she says, was from their peers. At Georgia, peer consultants help faculty members focus on areas where they need to improve. The consultants gather and assess data from student ratings, course materials, classroom observations, student interviews, and teaching portfolios. The evaluations and resulting plans for innovation are confidential and not part of the tenure-and-promotion process. Ms. Brickman has been a mentor to a graduate student, showing him how it’s possible, even in a class of 330, to break students into small groups to work on a project about genetic testing. The biggest fear some professors have about encouraging group discussions in their large lecture classes is that they’ll never be able to rein the students back in. “If we have 300 students and we whip them up into a roar, how do we regain control?” says Mr. Watson. Some professors add timers and microphones to their teaching tool kits. Something as simple as giving everyone a two-minute break partway through a lecture to read through their notes and fill in the blanks can make a big difference to students who sometimes feel as if they’re drinking from a fire hose, some professors say. Research has shown that students perform better when they’re given a break to catch up. Ms. Brickman would like to see the university expand peer mentoring, in which two faculty members at about the same level critique each other’s teaching styles.